Tag Archives for " Yelp "
19	How Can I Get My Local Business to Rank Higher in Search? For today’s answer I wish I could say there was some magic pixie dust, but the fact is getting your local business to show up high in the search results takes some work. For the local business the goal must be to move into what is referred to as the Google Local Pack – those 6-8 listing that show up for a local search. This is particularly important on mobile devices that are often pinpointing local only. There are many factors and of course a great deal has to do with the competitive nature of your particular industry. NAP is the directory acronym for Name, Address and Phone. This data clearly tells that a business is local and guess what – if you’ve been around for a while there’s a good chance some data source has this wrong. Here’s how to assure you have an accurate NAP listing in as many places as possible. Check with these major data providers to ensure your listing is complete and accurate. Now that your listing is accurate with the data folks, make sure that you listing in some of the more popular online business directories. Claim enhance these profiles. One of the best tools for doing this is getlisted.org – this free tool will find your listing or lack of in some of the major directories and lead you to the place where you can edit and add. 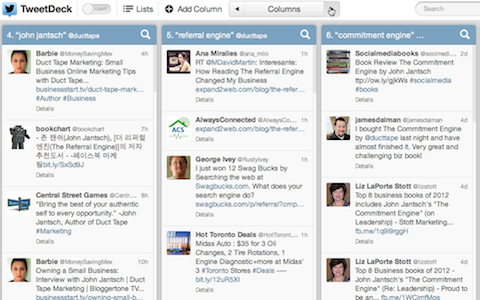 Brightlocal is another very powerful paid tool for improving your local presence. Reviews carry a lot of weight, both with search engines and would be customers. You must get serious about this aspect of local search. 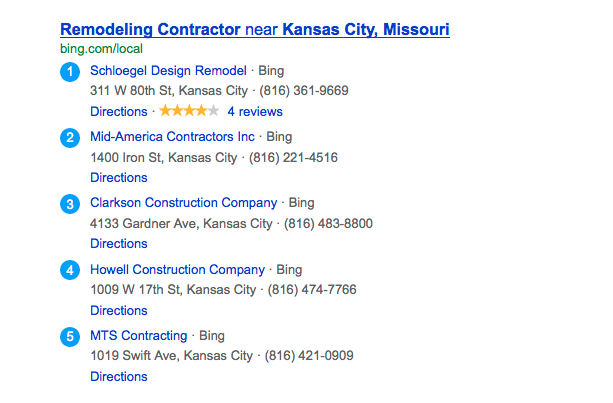 Note the image above – the site that ranks #1 in Google has the best review profile. Google+Local – Google want your business on Google+ so they’ve moved the local pages there. Start building your local page and focus on getting more reviews. 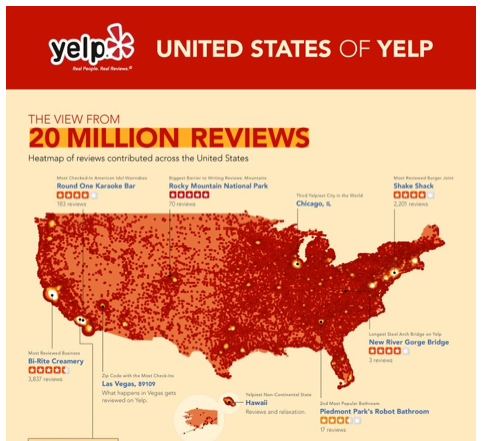 Yelp – On top of being the biggest review site Yelp provides Bing Local results. 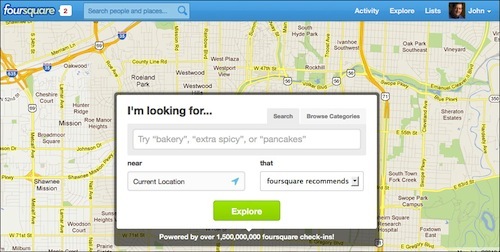 Foursquare – this location based check in site is working hard on becoming a local directory and should not be ignored. Add local terms such as suburbs, neighborhoods, places and events in your titles and subtitles. Create site sections or landing pages dedicated to local phrases. For WordPress users one of the best things you can invest in is the Local SEO for WordPress plugin from Yoast. This plug in will handle a great deal of the techie stuff for you and let you do some nice things with maps and directions. Content, content, content – that’s the message that marketers have been sending over the last few years and with good reason – customers expect to find it and search engines look to serve the best of it up. Social media participation has certainly made its way onto the SEO road map as an integral element of the optimization puzzle as well. The area in my view that doesn’t get enough talk however is reviews – particularly when it comes to local businesses. Reviews are one of the more important ranking factors for local businesses because they are a) content (customer generated no less, even better! 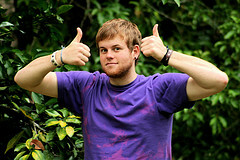 ), b) often social and c) a trust and authority signal for both search engines and readers alike. Like most things SEO related, people have tried to game the review system, but also like most things related to SEO, there’s a perfectly natural way to build links, reviews and authority. 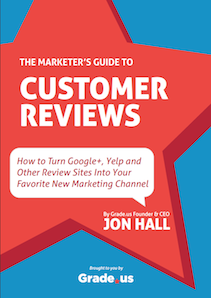 I teamed up with the folks at Grade.us to bring you The Marketer’s Guide to Customer Reviews – a free eBook that teaches you how to turn How to turn Google+, Yelp and other review sites into a new marketing channel. Grade.us is also a great tool for automating the review generation process and making it as easy as possible to add this source of content and SEO to the mix. You can see a Duct Tape Marketing review page in action here. I write about the power of building a network of strategic marketing partners a lot. I truly believe it’s an underutilized small business strategies. Getting a group of like-minded business to market each others products and services adds exposure, creates new demand and builds on some already established trust. I think people get the idea, but the challenge is often in finding ways to logically work together and promote each other. I shared a number of ideas on sharing content for referrals last week, but in this post I would like to offer another great way to work with your partners – give their stuff away. I bought a pair of running shoes a while back from an online seller and when I opened the box I found a note from the owner along with a pair of socks and some energy bars and snacks. First off, I loved the surprise element, but being a nosy marketer I contacted the owner and found that these were gifts from a couple of his closest strategic partners. Of course there was also information about how I could order more of these items as well. Think about how you might use this idea with existing or future strategic partners. 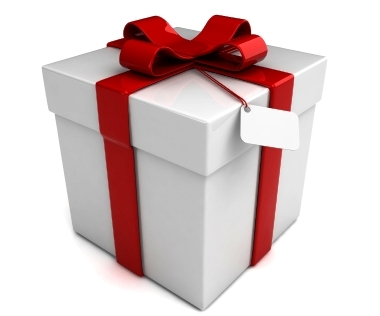 Do you have a trial or small product that your partners would love to give as a gift? Are there partners you work with currently that would have something you could give away? By building gifts into your products you create extra buzz with your customers and gain extra exposure both for and from your strategic referral partners – all of these elements can create even more referrals. And you don’t have to limit your thinking to free products. One way to get a potential or current strategic partner’s attention is to buy some of their products or gift cards for their products to use as thank you gifts. As a matter of fact, you don’t have to limit your thinking to products at all. I received a subscription pitch from a business publication that included a free offer from a partner to evaluate my pay-per-click advertising efforts. 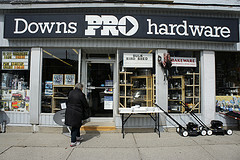 There are a number of service cropping up that can help organization make gifts to clients by finding local businesses. For example, a service called Yiftee allows a business to find something unique right in the community where a client or prospect may live. Yelp allows local businesses to feature gift certificates as well making it easy to find good products and services locally. I think this approach adds a nice personal touch. Along this same line of thinking, check out this free eBook from HelpScout – 25 Ways to Thank Your Customers for some additional ideas on gifting for referrals. This is such a simple, powerful and elegant idea that any business with a little creativity can employ. So, what will you give away today? Between you and me I had become a little bored with Foursquare. I think it has application for many small businesses and certainly know some businesses that use it quite well. As a consumer user however, it never really offered up enough value. I think that’s changed with the introduction of what Foursquare is calling the Explore function. Explore has been on the mobile app for some time, but now it’s been added to the newly designed Foursquare website and it gives Foursquare a unique opportunity to compete with Yelp and Google Maps. The way Explore works is that it allows you to search for businesses that your friends and the other hundreds of millions of Foursquare users have found and commented on. You can use your current location or put in the location of your next vacation to start finding a place to eat lunch today or get a drink near your hotel. When you find a place it will tell you if any of your friends have checked in there in the past. One of my favorite features (and one that should get the attention of business owners) is that Foursquare also searches through the tips notes that users leave. So, if you want to find the “best biscuits and gravy” at a great breakfast place you simply add that to your search and Foursquare will go to work. 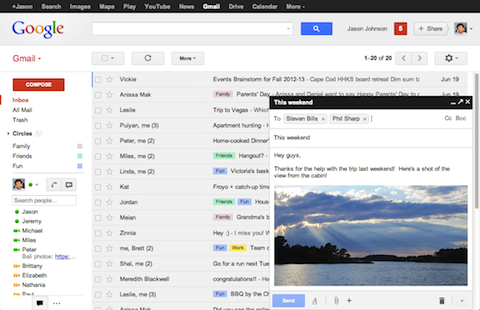 My favorite though is that you can filter your searches to only places with specials. This effectively gives the user a great special finding engine and the business a great additional reason to run specials. To me that adds another great reason to add your business to Foursquare and start enhancing your business presence there. If your business is already in Foursquare, find it and claim the profile so you can information to it. If it’s not yet listed download the Foursquare app and check in at your business and make sure you add accurate address information. Then you can go to the Foursquare website and claim your venue. No matter what your business sells, how it sells it or how and where people buy you it, people are going online to find it, pure and simple. That’s as true for those one of kind hand made earrings as it is for the spa and auto repair shop in their neighborhood. And, it’s increasingly true for the local insurance provider, landscaper, plumber, attorney and tax professional. So, what does this mean for the local small business? You’ve got to start thinking about your online presence as a central tool for driving people offline and into your store, sales presentation, meeting, demonstration, appointment or evaluation. Below are five ways to think about your online activity as an offline opportunity generator. When people do find and visit your site make it easy for them to use your website to get a free pass, coupon or trial product. Put a tool like GenBook on your site they can find a time and schedule appointment without needing to call. Make sure that you have turn by turn directions and links to maps so they can find your business and even send the directions to their smart phone. Most people run ads to get people buy, what if you thought about your online advertising as a way to simple drive people offline – O2O? Create local campaigns using Google Adwords that drive people to your website to take advantage of the calls to action, such a the free pass or coupon, that I discussed in the previous point. Make sure that your Google Places page is complete and compelling and consider the coupon and advertising options available for this tool. Look into Facebook targeted ads for your calls to action. You can target local Facebook folks all the way down to targeting fans of your competitors. To make your O2O advertising even more effective create local landing pages for each campaign or even neighborhood you are targeting. Offline networking is still a great way to create and build potential relationships, but you can really amplify this tactic when you add some simple online tactics to your networking efforts. When you connect offline with a prospect at say a Chamber event, move to also connect online and watch how much faster you can build a relationship. Employ Social CRM tools like Rapportive or Nimble so you can easily connect the social profiles of anyone you meet to their record. This will make it much easier to learn how to connect. Look at tools like MeetUp that make it easy to create offline events and gatherings using an online marketing system. Most social networks give you the ability to create groups. Some organizations have had tremendous success by creating and facilitating local, special interest groups on networks like LinkedIn. The key here is to think “interest group” and not something that’s clearly a promotional tool for your business. If you can create an industry group or some other niche topic that allows your customers to explore and expand an interest they have, you’ve hit on a formula that’s very potent. Increasingly, our prospects are not only online they are mobile while doing so. There are some very creative ways to take advantage of this fact and drive people with great buying intent offline. First off make sure you claim your location on sites like Yelp, Facebook, Foursquare and Twitter. This way you can enhance the details and make sure people using geo location services can check in at the right place. Create and test an offer on a service like Foursquare that can help highlight your business when someone checks in at another nearby business. Look into the group coupon tools like Groupon, Google Offers or Living Social, but make sure you’re ready to capture the leads these programs produce in a way that allows you to turn a low profit sale into a long term customer. Think about ways to create check-in games that you could use as part of a promotion. Get a group of strategic partners to participate and offers special deals for people that have checked in at a number of your partners on Foursquare of that take a photo of their purchases at a number of partners and posted it to Twitter or Instagram. As you can see, the way you can employ this kind of thinking is limited only to your imagination, but there’s no denying the importance and effectiveness of this strategy. Google has the money, resources and clout to compete in any market they enter fully. Problem is they also seem to suffer from a focus problem. They tend (or at least it appears to me) to release features without strategy. Of late, however, it looks like they just might be getting their local strategy together and marshaling a suite new features combined with existing assets to put themselves in position to take a giant leap in the local reviews, local offers, and local social games to go with their strong local search position. Two barely noticeable moves in the last couple weeks give hint to the this focus strategy. I took note of both and wrote quick updates – The first was the addition of optimized reviews in Places Pages and the second was the addition of reputation management features in Profile Pages. Both of these moved signal a renewed focus on making both Profiles and Places pages more important in their ecosystem and perhaps ultimately in a social network of some sort. Of course the Google Offers play – their answer to Groupon’s success – has been unfolding for a few weeks, and I had my doubts they would do what it would take to slow Groupon, but hey, it’s Google and you never know. Business owners are invited to claim their pages, create special offers and try out ad products such as Boost right from the city home page. There’s also an interesting integration of acquisition TalkBin, a tool that makes it very easy for people send SMS messages to any registered business. 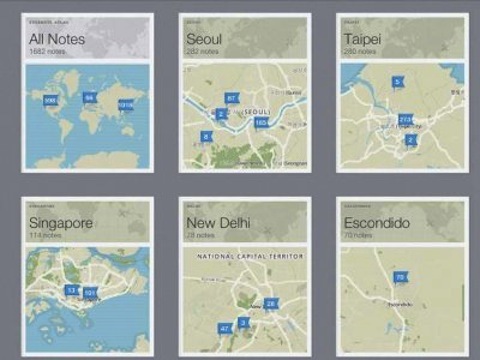 The cities chosen for the City Page beta test closely align with the first Google Offers beta tests and can be supported by the local Google sales and support staff. With Google’s ability marry advertising with offers and a local portal this could prove very disruptive to Groupon, but also to many local portals services such as Yelp! and CityPages. Reviews from customers must be seen as an important part of the overall content strategy for any business, particularly local businesses. The fact that prospects have begun to expect to find reviews and rely heavily on those reviews when making buying decisions combined with the data that suggests search engines seem to be using reviews as a major component in local rankings, requires a major mind shift when it comes to addressing the category of reviews. It’s no longer enough to sit back and hope you get some nice reviews from all those happy customers. In today’s increasingly competitive local search environment, you’ve got to make reviews a significant piece of your content strategy and build processes to make sure your business is focused on leveraging every review you can acquire. It may seem like I’m being a bit overly dramatic here, but the reason I believe this is going to take a mind shift is that it’s also going to take some work, but right now the organizations that are working this angle hard are winning. Dr. Justin Bazan of Park Slope Eye in Brooklyn has embraced social media and review sites with enthusiasm and it appears to be paying off. 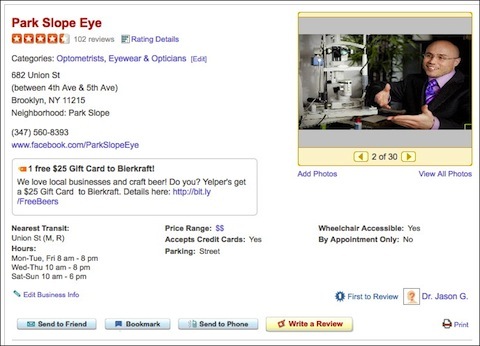 Park Slope Eye has over 100 positive reviews on Yelp and is approaching that number on Google Maps as well. 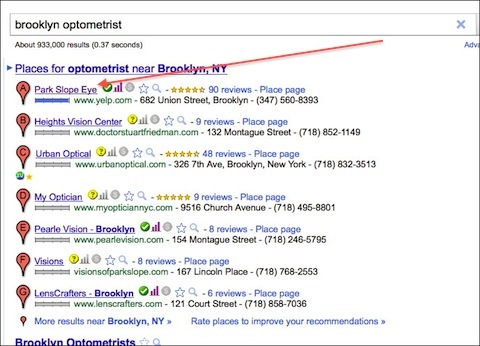 Do a Google search for Brooklyn Optometrist and Park Slope Eye come up number one in the local listing. Since Park Slope was putting so much emphasis on reviews on Yelp, they were receiving them, but many were getting stuck in Yelp’s review filter and, while Buzan could see them in his account, they were not available publicly, so he added this step to his process. Okay, now understand that in order to get the kinds of reviews they get, they’re doing a few other things right, but this is a great example of how a local business, doing great things, can get great results for very little money using a customer content strategy and social media tools. This kind of engagement around reviews and taking their creation on as a content strategy is the kind of grass roots marketing that every local business must embrace. Short post here to point out something I found at a local coffee shop. Businesses need to participate in the ratings and review game and by that I mean find ways to get your customers involved in creating authentic reviews. A local coffee shop I frequent, called The Roasterie, hosts a wireless hotspot and when you log in to the service you arrive at a home page that provides information about menu items and happenings at the shop as well as the prominent image below that invites you to write a review. This shop does very well on Yelp! and I’m guessing this kind of participation helps. What are you doing to keep reviews top of mind for your customers? Reviews and testimonials have always been a nice way to offer third party proof that your company does what it says it does and that your customers are happy campers and willing to talk about it. 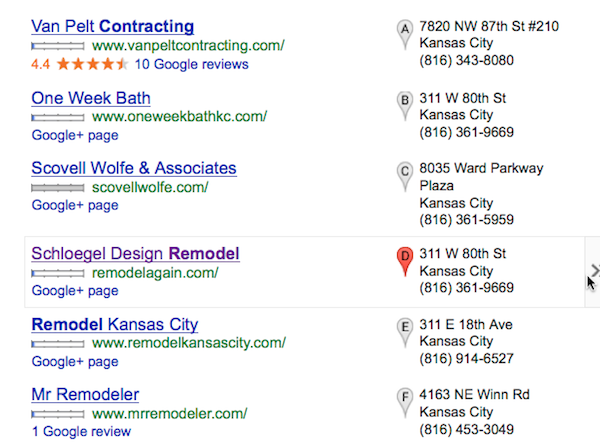 Reviews, however, have become even more important now that local search directories like Google Maps and Yelp! have made them a foundational element for ranking well for local search. Below are five ways you can look at systematically creating reviews. I stumbled onto this idea quite by accident, but it’s very effective. Every now and then a prospect would ask me for several references. I would provide a list of 3-4 happy customers and that was that. If a prospect reached out to these customers, most often they would copy me on their response. The amazing thing is that because they we basically telling someone else why they should hire me, it turns out these were the best testimonials I ever received. Instead of them writing them to or for me, they were writing them to and for prospective customers. This approach was so effective that I started requesting that future prospect contact some of my customers. When you get that unsolicited testimonial, no matter where it comes from, make sure you are using it in several ways. 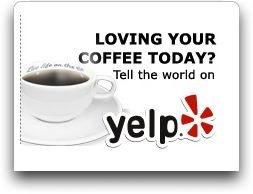 I a happy customer writes a review on Yelp, post that review on your website, in your store and in next month’s newsletter. If a customer sends you a raving review by way of letter, phone them up and ask if they would provide that review for your Google Places page too. Of course I’m going to suggest this one, give to get works here too. By making reviews, recommending your network on LinkedIn, and reaching out to companies you do business you start one powerful part of the review and testimonial foundation. It’s always a great way to show how you value the process and in turn benefit from the occasional authentic reciprocation. I’ve written about this idea before, but it’s such a fun one I had to include it here. Invite your customers to a nice appreciation event, serve up some wine and then ask them if they would like to record a video testimonial or review with the camera crew you’ve hired for the night. People love to get on camera and you can further incentivize them by offering up a 5 minute video where they can talk about their business. This video content will be gold for your website and you’ll provide a great service by helping them create something for their site. Rating and reviews from users and customers are crucial. Find some way to install one or more of these options and collecting them will simply become a part of the system.